Many of our citizens have already been affected by a new type of fraud. The shameless fraudster don’t stop their relentless efforts to cheat us out of our well deserved stationery, working on schemes to exploit our deep desires for luxurious writing instruments. The latest victim of the fraudsters is one of the staple pencils found in the office supply cabinet of bankers and dictators of small countries, the Graf von Faber-Castell Eine Cassette * hochfeiner Taschenbleistifte * Nr. II, versilbert. 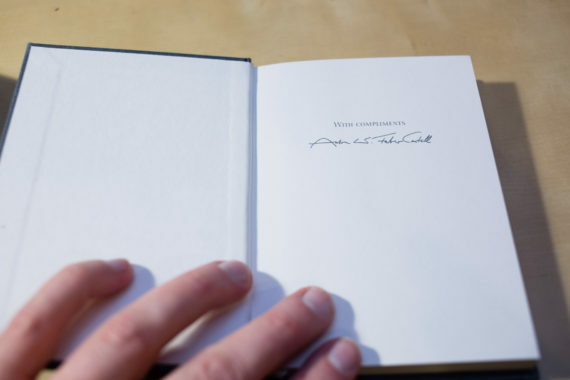 Unlike the real pencil, which is inscribed “Graf von Faber-Castell” the forger must have been a bit too much of a Tom Selleck fan and inscribed the cap ‘Magnum’. Open the picture in a new tab to compare the details. They also seem to have used a TiTi Kyung In T-Prime which had repeated appearances in this blog since 2009. If you have any tips that could lead to the arrest of the forger please contact the Posh Stationery department of your local anti fraud organisation. Just to spell it out to avoid misunderstandings: I can’t say this is a popular pencil (it’s not a popular Montblanc model) so I doubt anyone (other than myself for the photos in this blog post) would create a fake version. After the quick interruption to my Insights X posts (I just had to post about October’s Pencil Pot of the Month, so that the post is on time): let’s continue with all the cool stuff from Insights X and move on to Faber-Castell. Unfortunately there wasn’t enough time for me to look around at their stand as much as I would have wanted to, so this is not a in-depth as I would have liked it to be. Faber-Castell did hand out goody bags to everyone from the blogger group and I am quite happy that this included the green (Castell 9000) version of the Perfect Pencil. You might remember that I lost mine after years of use. This summer I bought a new green one in Müller, a German drug store chain. They sell them for around €8. Even though I got one again since summer it’s nice to have a spare one (the one from the goody bag) – just in case I lose it again. In my opinion the Castell 9000 version of the Perfect Pencil is by far the best product Faber-Castell is selling (but I also love their dust free eraser). 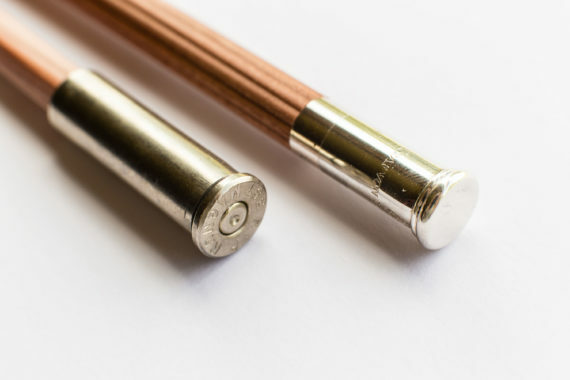 There were also some Perfect Pencil related news: there’s a new Magnum version of the Graf von Faber-Castell Perfect Pencil, but Sean has already mentioned this a few weeks ago, so it might not be news to you. 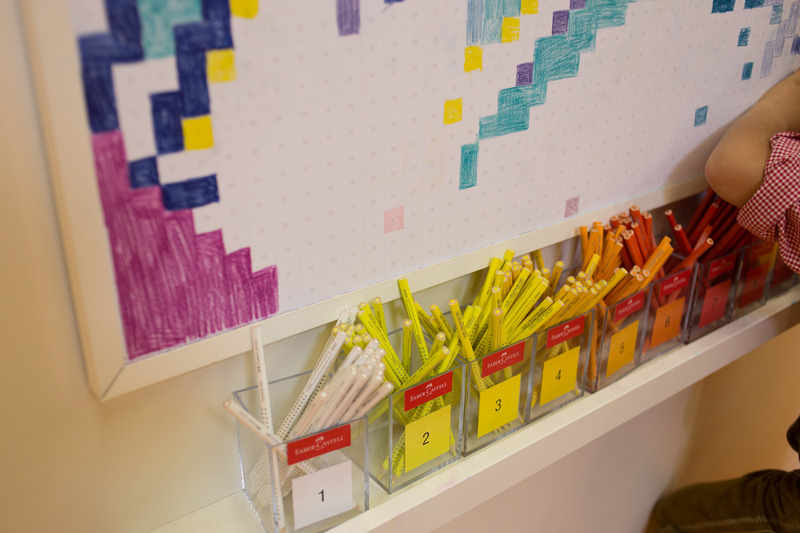 One of the new line of products Faber-Castell presented was the Pixel-it line. My guess is that if adults want to be kept busy with colouring books then children want that to. Faber-Castell thinks that with normal ‘connect the dots’ pictures you often know in advance what the final result will be. This reminds me of a scene from Red Dwarf with our favourite Scouser. This video should hopefully start at the right scene (7 minutes 44 seconds in). With these new Pixel pictures you don’t draw lines but colour squares / pixels that make up the picture. The colour you are supposed to use is printed as a number in the square, which solves the problem of making it too easy to recognise the shape of the final picture too soon. I think it is possible to recognise some shapes, before starting to colour the picture – especially if there are areas of colours represented by a single digit number next to areas represented by a double digit number, but the surprise doesn’t get spoiled as much as with connect the dots pictures. 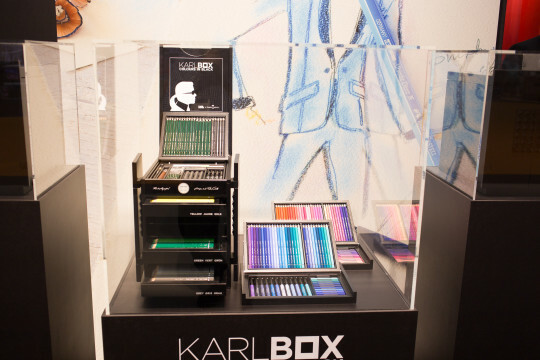 The centrepiece of Faber-Castell’s stand was the Karl Box. They were so proud of it, they also presented it at the entrance of the trade fair1. It contains a selection of Faber-Castell pens and has been created together with Karl Lagerfeld. It’s limited to 2,500 and the price is 2,500, too – €2,500 that is. I was quite excited to see Insights X branded Grip 2001 pencils. Unfortunately they were not part of the goody bag. 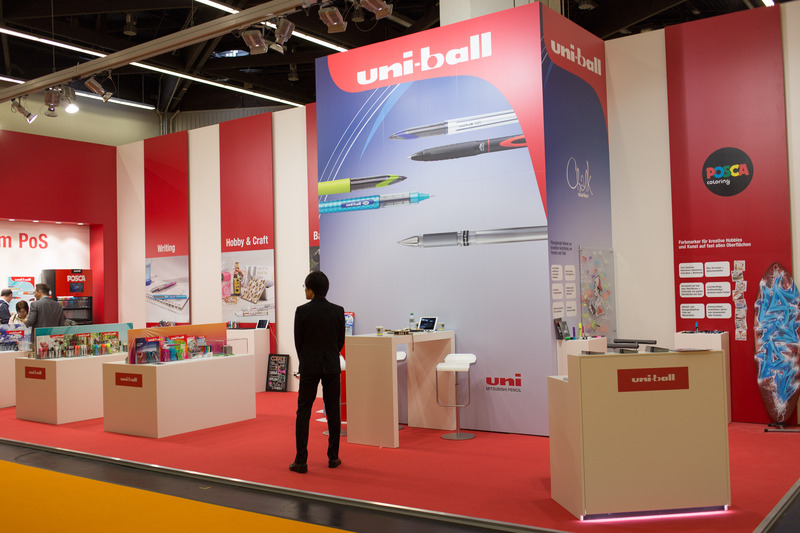 This might not be well known outside the German speaking countries, but in Germany (maybe even more markets, I don’t know) Faber-Castell is distributing uni-ball products. I am not sure when this started, but when I was still living in Germany uni-ball products didn’t have the Faber-Castell logo printed on them. Now they do, so I am not sure whether the cooperation is just more obvious now or whether there was no cooperation in the past. For the Insights X that meant that Faber-Castell and uni / Mitsubishi Pencil were next to each other. Faber-Castell also included uni-ball products in their press releases. This included the ‘Trend’ version of the uni-ball Air, a pen I was disappointed with, mainly because of the false claims in their UK advertising. Well, those claims about producing fine and broad lines are the same in Faber-Castell’s press release, but at least they don’t seem to be the big selling point for Faber-Castell. Faber-Castell also presented the uni-ball Power Tank Trend – the advertising seems to indicate that this pen is similar to a Fisher Space Pen. When I asked at the uni / Mitsubishi Pencils stand about pencils I was told that they don’t do pencils in this market and therefore don’t have any here. Maybe not selling pencils in this market is part of the agreement they have with Faber-Castell? Who knows. 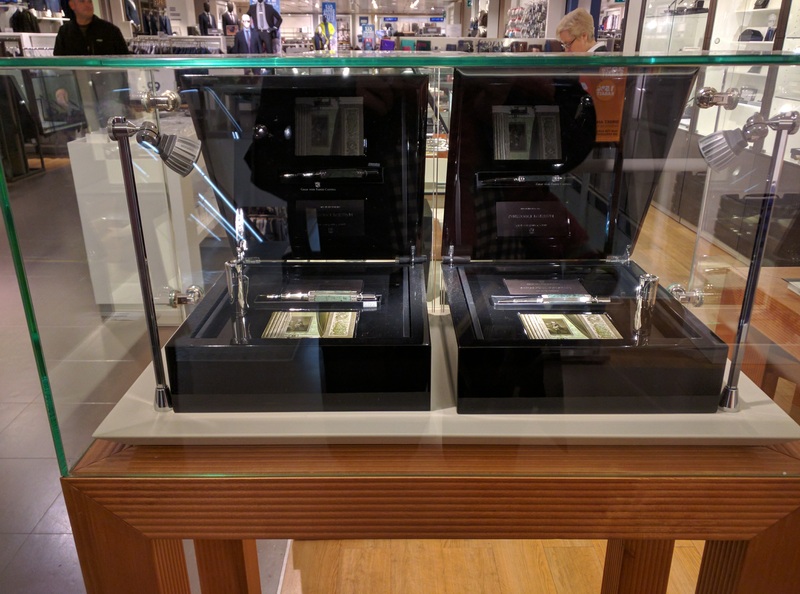 The most exclusive Faber-Castell products were not at Insights X though, instead I found them in Karstadt, a department store in Nuremberg’s city centre – just opposite Staedtler’s shop. 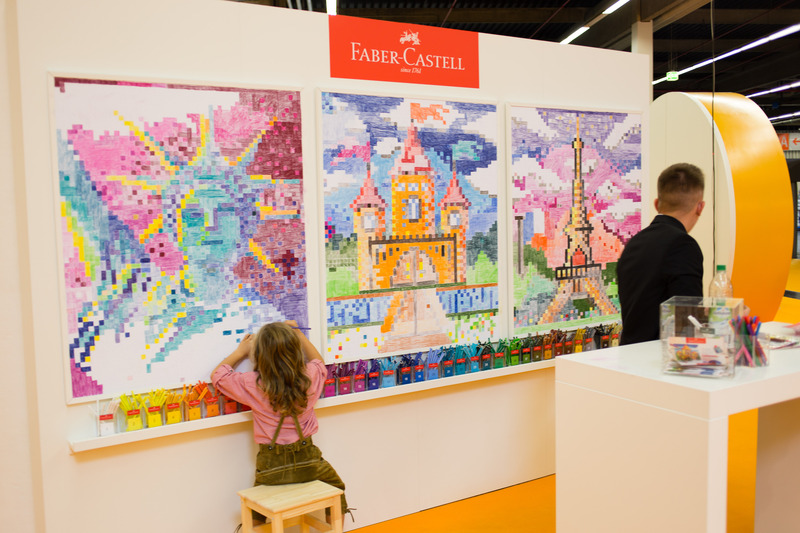 I wonder whether Faber-Castell thought something along the lines of ‘If Staedtler has a shop in the city centre we also want to make sure we have a big presence in Nuremberg, the closest city to our headquarter’. 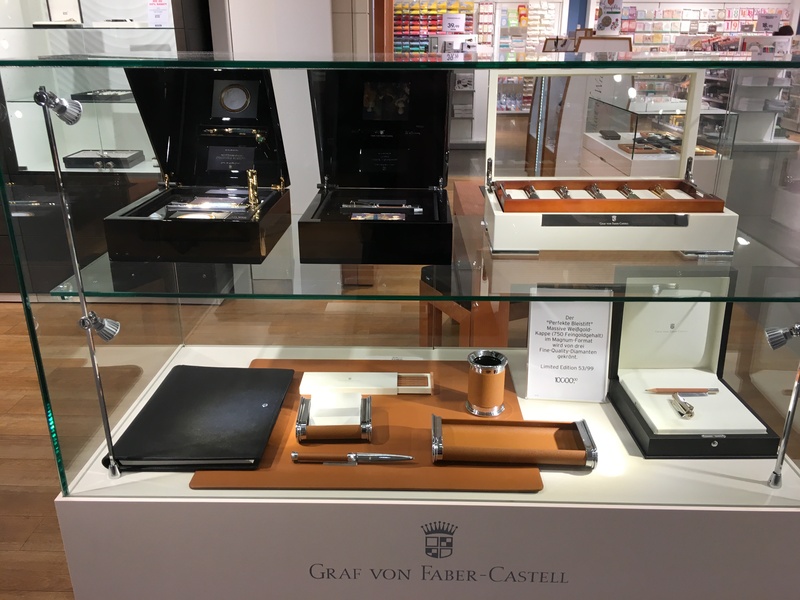 Well, what I saw in Karstadt were the most expensive Graf von Faber-Castell products I have seen in my life. Two Pen of the Year 2015 Sanssouci Potsdam. One of them will set you back €3,500. 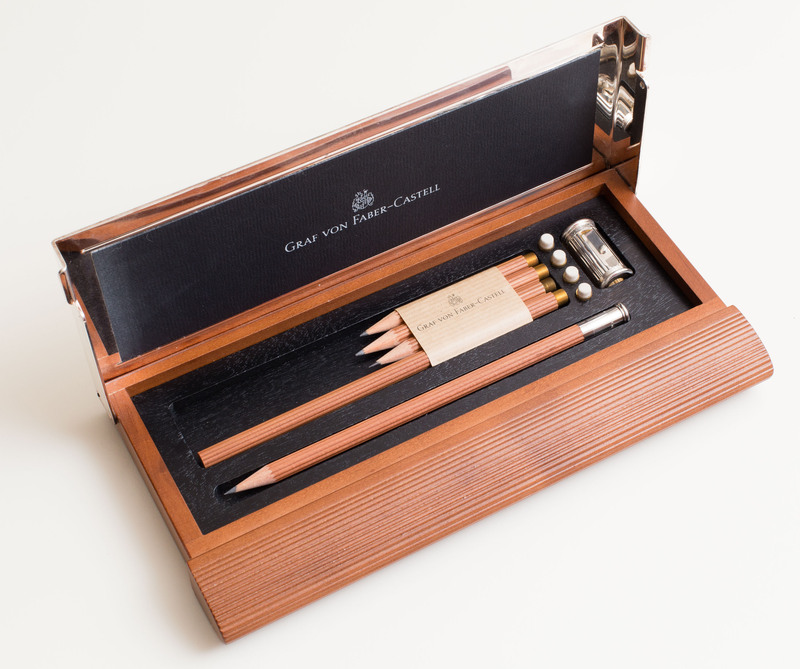 And here’s the pencil that is worth more than my car: a Perfect Pencil for €10,000. 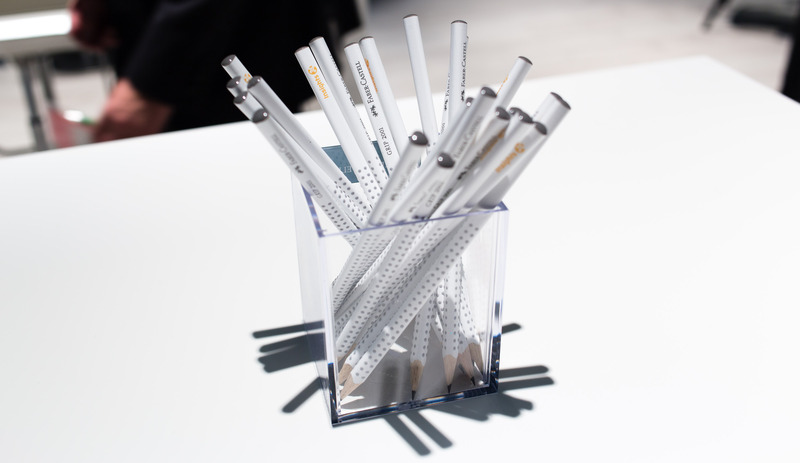 The white gold and diamonds Perfect Pencil. Only 99 have been made. I was surprised to see that Karstadt didn’t sell any Pelikan or Staedtler products. I found that rather odd as other department stores like Kaufhof sell these brands. As usual please open the links on the images in a new tab to see them in high resolution (otherwise you can’t see the €10,000 pencil well). Please have a look a Lexikaliker’s aggregator Insights X post if you want an overview and read more Insights X posts. 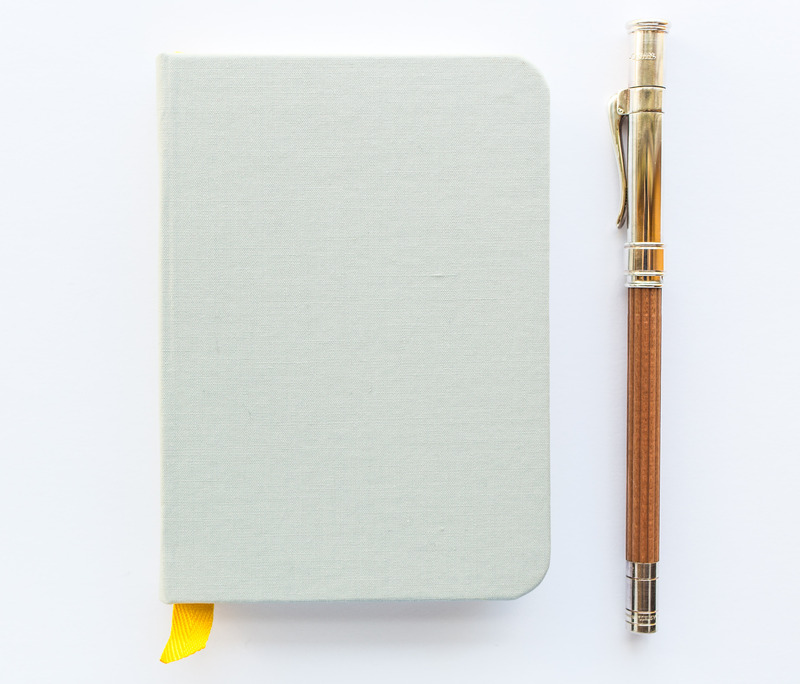 Today: a noble notebook and pencil. 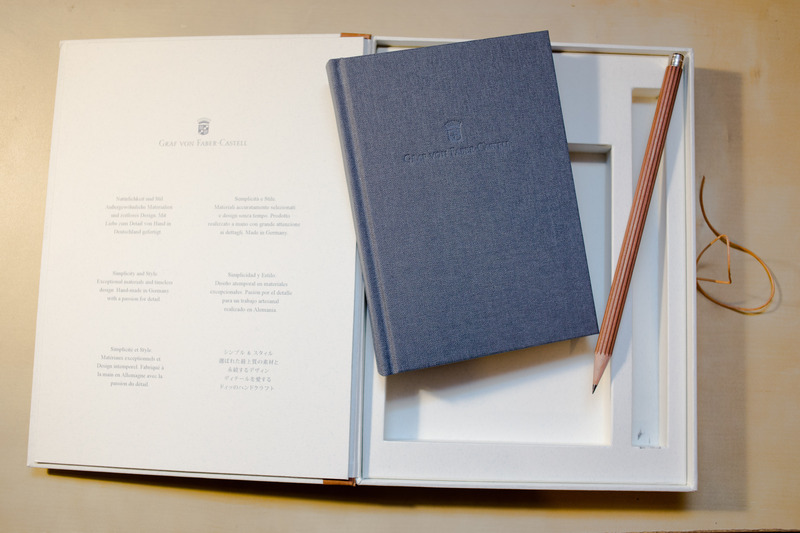 Graf von Faber-Castell, that’s Faber-Castell’s posh product line started in 1993. Back then our favourite count, Anton-Wolfgang Graf von Faber-Castell, introduced this line as part of Faber-Castell’s reorientation. As a pencil enthusiast, I am quite happy that the Graf von Faber-Castell line has not neglected the humble pencil. 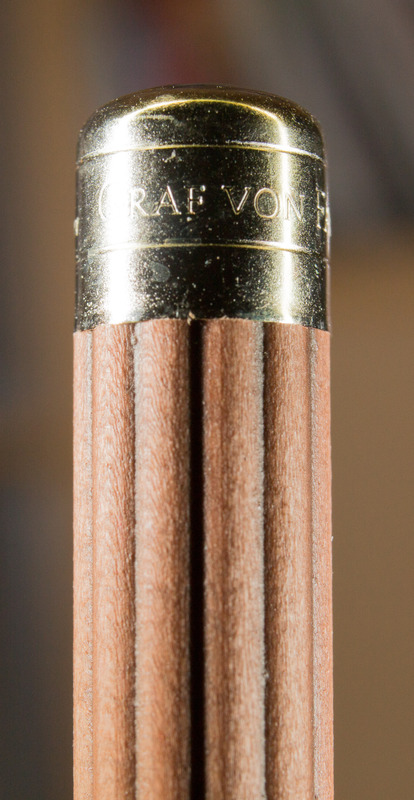 There was a Graf von Faber-Castell version with only an eraser cap, a pencil extender and the perfect pencil and there were some other pencils along the way, like the fluorescent Graf von Faber-Castells. 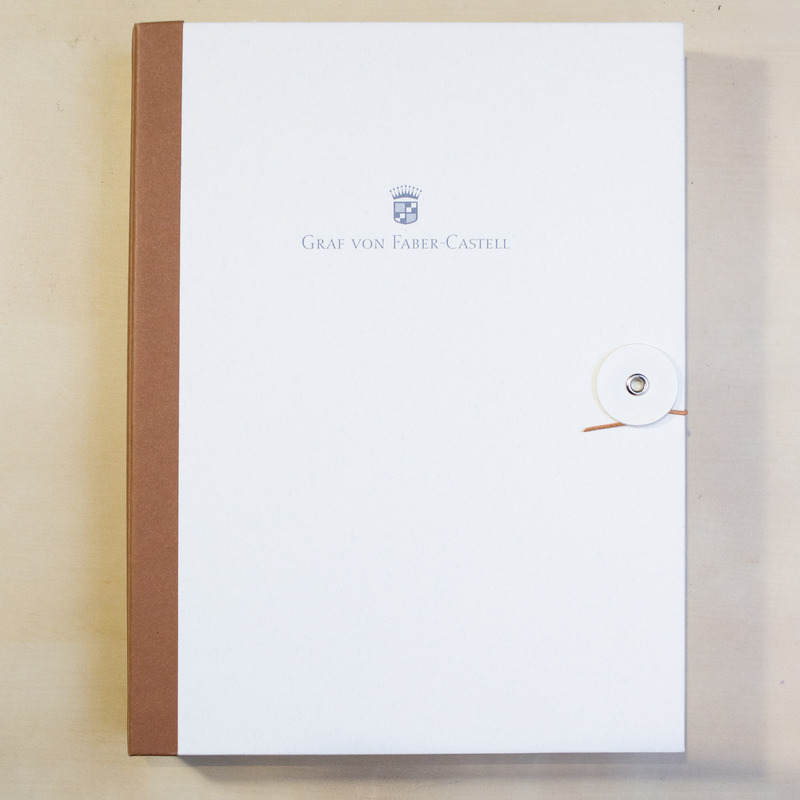 This Graf von Faber-Castell Journal and Pencil set is available for free with most purchases from The Pen Company’s Graf von Faber-Castell line. I got it free of charge when I recently placed an order with them. 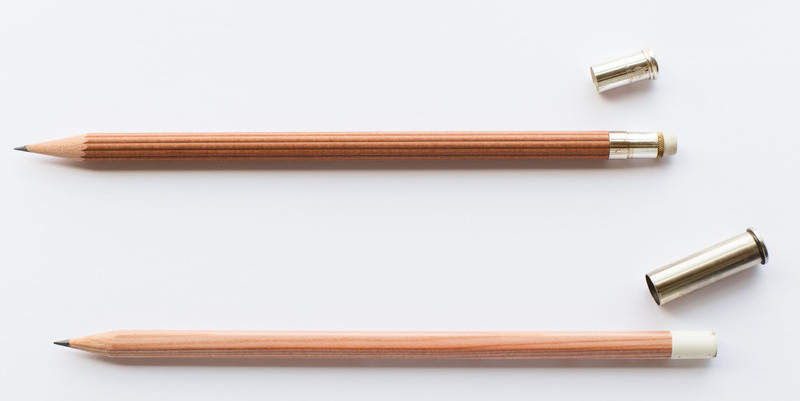 The pencil included in this set is one of their fluted pencils with a silver plated end cap. I assume it is silver plated, not solid silver but I am not 100% sure. These pencils are a bit harder than the very old Graf von Faber-Castell pencils, but certainly softer than a Faber-Castell HB pencil. In any case, they are a pleasure to write with while keeping the point fairly well. 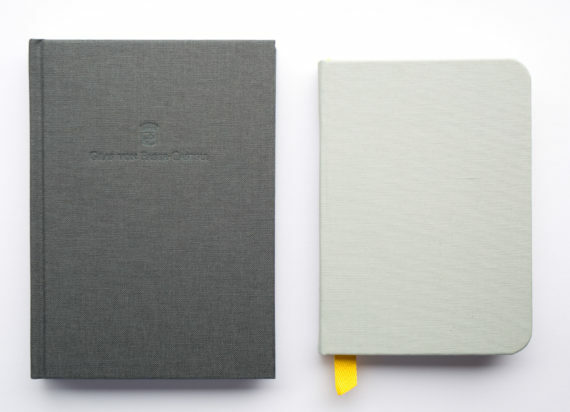 The notebook you get is clothbound and has thick, creamy paper in a kind of slightly yellow shade of light beige. 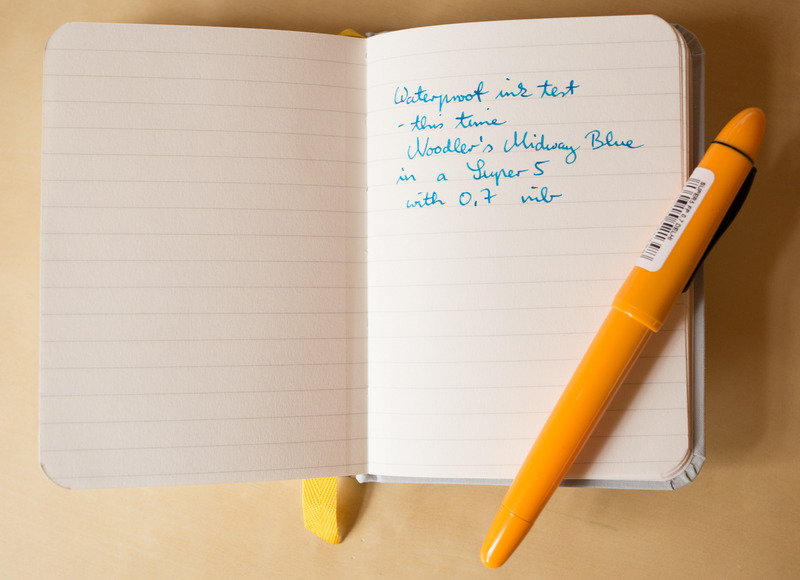 It feels quite different to the ordinary white from most notebooks. Despite the smooth surface, the paper is taking the graphite on very well. I am spelling this out because some smooth paper, like the one found in the original Field Notes, is very smooth and doesn’t work well with pencils – as if the paper is too smooth and not abrasive enough to get the graphite off the pencil and onto the paper. This Graf von Faber-Castell paper does, however, feel very smooth to the touch but is ‘abrasive’ enough for use with HB pencils. The writing experience on this paper is just excellent. It’s a shame you can’t buy these individually, but since they’ve been around for at least five years I hope that we will still see this notebook as part of some special offers in the future. 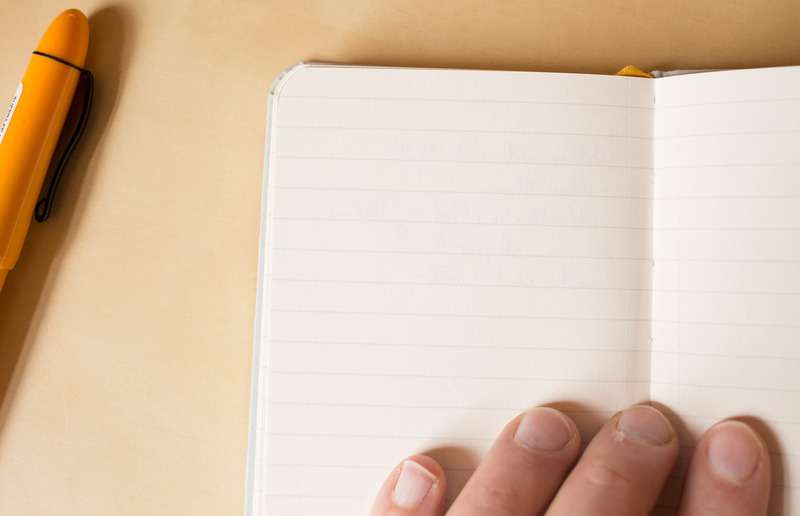 This blog post has been published on The Pen Company’s Blog, too. Just to spell it out, I have not received any money for writing this blog post. 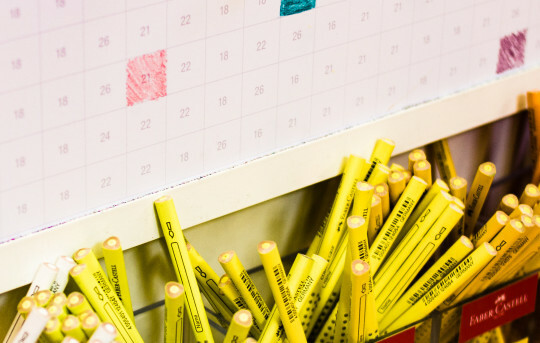 Pencils not only seem to be reliable writers, they also seem to be reliable in terms of keeping their prices affordable. In June this year, I used R to do some web scraping. The data collected was supposed to be for a follow-up of my Why did stationery become so expensive? blog post. Well, this is the follow up blog post and there isn’t much to show, maybe because we are talking about wood-cased pencils. Fountain pens and mechanical pencils had a more extreme price development. I did the R code not only for the follow up, but also to teach myself a bit more R, I would have normally done this in PHP, which I am more familiar with, having used it since the 90s and having used it for similar tasks in the past (even though people didn’t call these tasks web scraping at that time, or if they did I didn’t know). So what exactly did I do? 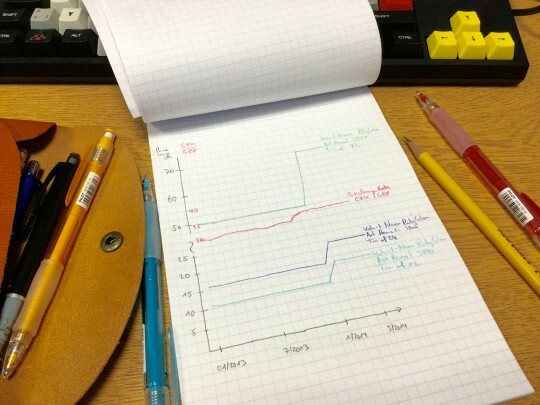 I was looking at how the prices for pencils have changed on the Cultpens web site over time. My code that will get historic prices from archived versions of the Cult Pens pencil web page from archive.org is available on GitHub if you want to try it or change it for your own purposes. If you do please bear in mind that my code is not very good, I realise this, but as I am new to R I don’t know how to improve it (at the moment – I hope to find more time to learn R in the future). Also, if you try this please try to minimise any strain on the server you get your data from. 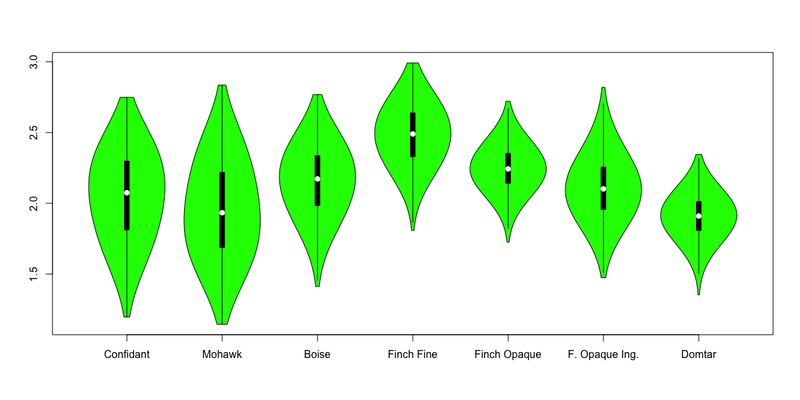 The findings were less exciting than expected. VAT has changed a few times over the last few years and there are obviously currency exchange rate fluctuations to be taken into account, as well as inflation and other factors. 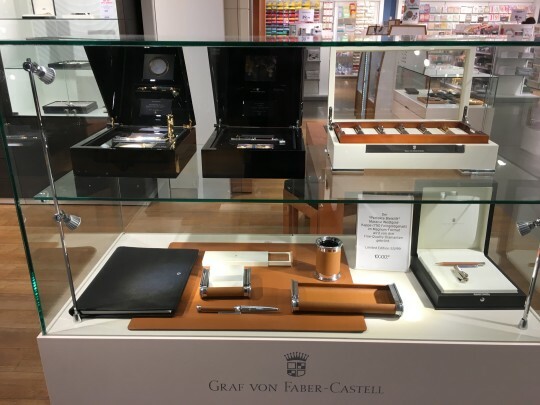 The most interesting changes I could see was a > 10% price increase for some Graf von Faber-Castell products between 2010 and 2011. The Tomboy Mono 100 got cheaper over the years. Between 2010 and 2013 it got > 20% cheaper. The most extreme price rise was for Koh-I-Noor products. At the beginning of 2014 the big Polycolor Art Pencil tin got nearly 40% more expensive, smaller tins got more expensive, too. Overall prices seem remarkably stable. As mentioned before I assume the price stability is also linked to this being pencils. 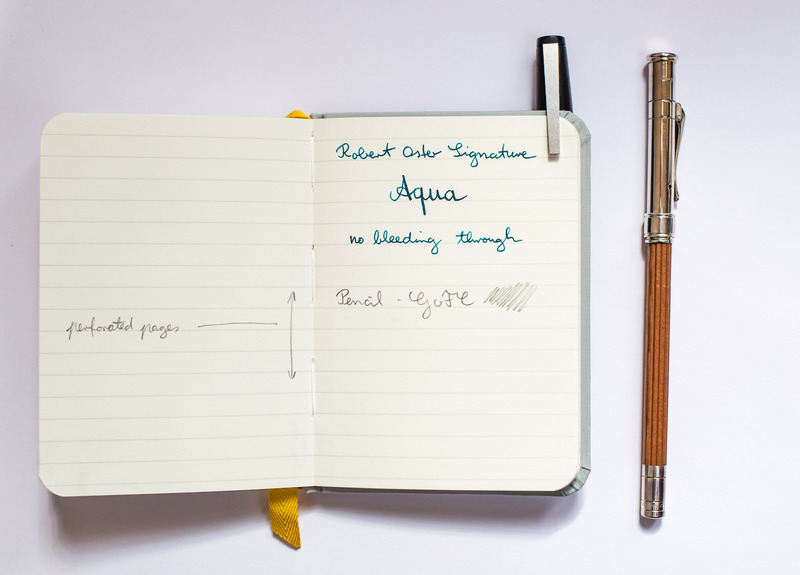 As shown in my previous blog post fountain pens seem to attract more extreme price hikes. Picture: Mongol plus Pilot Color Eno pencils on Brunnen Der Grüne Block.